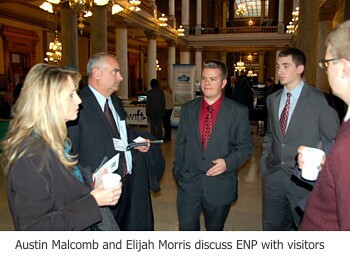 ENP displayed our program at the Indiana Statehouse on Wednesday, January 22. The display was near the rotunda, and part of a group of displays promoting aviation in our home state. The booths represented a broad cross section of aviation, and the event was well attended by both visitors, and state officials. ENP was represented by Bob Kelly, founder, Austin Malcomb and Elijah Morris, students, and Jeff Malcomb, mentor. 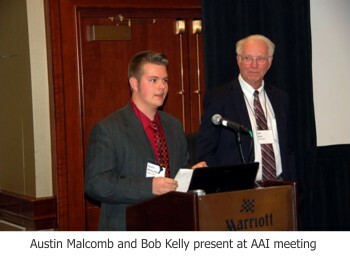 Later in the day, Bob was speaker at the quarterly meeting of the Aviation Association of Indiana. About 150 aviation professionals heard about ENP, many for the first time. A number of questions were asked, and at least three persons expressed interest in having a project in their school system. "Purdue University's Department of Aviation Technology understands and recognizes the value of the STEM experience students receive who participate in the Eagles Nest program. To help support this program and the students who participate, Purdue's Department of Aviation Technology will consider granting any Eagles Nest student 3 credits once accepted into any of the Aviation Technology programs. The Eagles Nest student must present a signed statement which proves they have participated in an Eagles Nest program to their counselor, the Aviation Technology Department will then evaluate the experience and consider the granting of experiential credit for students participating in the program who enroll in any of the Purdue Aviation Technology programs." We look forward to working with Purdue in this and other rolls. Purdue is the third university to offer credits for our students. 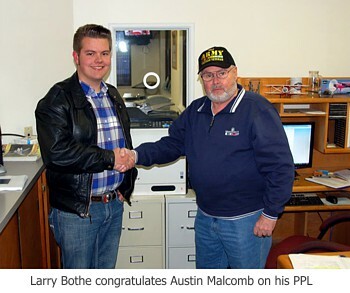 On Saturday afternoon, January 4, Autin Malcomb became the first Eagle's Nest student to receive his Private Pilot License. That was a fine birthday present-Austin turned seventeen that day. He has taken all his training at North Vernon Municipal Airport (OVO) and Ron Huddleston is his instructor. Austin soloed exactly one year before, on his sixteenth birthday. Both of these events were aviation firsts for students flying experimental aircraft. 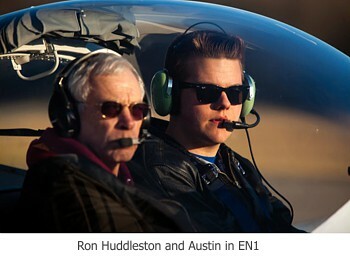 "It is very special to do this in an aircraft you helped build," Austin said. Ron Huddleston commented on how much better the builders knew the airplane systems, compared with most beginning pilots. Austin flew Eagle's Nest One, the first ENP project ever completed. The plane performed flawlessly, as did its pilot. CFII Larry Bothe of Seymour, Indiana, performed the oral and practical tests. Both Larry and Ron provided their services gratis, something we at ENP deeply appreciate. It was a big day for the PLTW Aerospace Engineering students at League City's Clear Springs High School - It was the day the Eagle's Nest RV-12 they spent the past 7-1/2 months building was going to fly! In attendance were 30+ student-builders, aerospace engineering instructor, Mr. Roger Elder, assistant school principal, Mr. Troy Scott, City Council representative, Mrs. Heidi Thiess, ABC Channel-13, and numerous other news reporters. Nighthawk banner towing circled the field during the event with a message congratulating the student-builders for their outstanding accomplishment and Bruce Bohannon & Rick Carr made several precision formation passes with smoke-on to set the stage. EN3 was signed off on Friday and took her maiden flight today, May 26, 2013.